Potatoes covered in a cheesy, creamy Hellmann's® or Best Foods® Real Mayonnaise sauce. This melt-in-your-mouth potato recipe is perfect for entertaining. 1 Preheat oven to 375°. Spray 2-qt. shallow baking dish with no-stick cooking spray; set aside. 2 Cover potatoes with water in medium saucepot; bring to a boil over high heat. Reduce heat to low and simmer until potatoes are almost fork-tender, about 5 minutes. Drain and set aside. 3 Bring heavy cream, milk, Hellmann's® or Best Foods® Real Mayonnaise, wine, garlic and black pepper just to the boiling point over medium heat, stirring occasionally. Reduce heat to low and simmer 5 minutes, stirring occasionally. 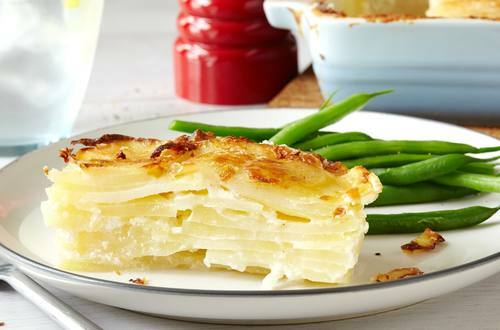 4 Alternately layer cooked potatoes with cream sauce in prepared baking dish. Sprinkle with cheeses. 5 Bake 20 minutes or until potatoes are tender and top is golden and bubbling. Let stand 10 minutes before serving to thicken.